Given the large size of the printing industry, and the extraordinary volume of chemicals it consumes, it is not surprising that it also generates a significant amount of pollution. Gaseous emissions have been identified as the second greatest pollution problem (after effluent quality) for the textile industry – and these are largely generated in printing. Speculation concerning the amounts and types of air pollutants emitted from textile operations has been widespread but, generally, air emission data for textile manufacturing operations are not readily available. Air pollution is the most difficult type of pollution to sample, test, and quantify in an audit. According to the U.S. EPA, the printing industry releases 99% of its total Toxic Release Inventory (TRI) poundage to the air, while the remaining one percent of releases are split between water and land disposal. This release profile differs significantly from other TRI industries which average approximately 60% to air, 30% to land, and 10% to water release respectively. Average VOC emissions per textile print line are 130 Mg (tons)/year for roller and 29 Mg/year for flat and rotary screen. In 1995, more than 41 million pounds of toxic compounds were transferred or released into the environment by the printing industry in the United States alone. The table below shows some of the polluting chemicals used by the textile printing industry. All ten are petroleum-derived. Toluene, although used primarily as a solvent, is also used throughout printing for cleanup purposes. Toluene contributes to the formation of ozone in the atmosphere; studies have shown that unborn animals were harmed when high levels of toluene were inhaled by their mothers, although the same effects were not seen when the mothers were fed large quantities of toluene. Note that these results may reflect similar difficulties in humans. Data on ethylene glycol mono-n-butyl ether is used to represent all glycol ethers because it is the most commonly used glycol ether in printing. It can leach into ground water, and reacts with photochemically produced hydroxyl radicals. For humans, moderate exposure may cause central nervous system depression, including headaches, drowsiness, weakness, slurred speech, stuttering, staggering, tremors, blurred vision, and personality changes. These symptoms are such that a patient, in the absence of an accurate occupational history, may be treated for schizophrenia or narcolepsy. Methyl ethyl ketone contributes to the formation of air pollutants in the lower atmosphere; breathing “moderate amounts” for short periods of time can cause adverse effects on the nervous system ranging from headaches, dizziness, nausea, and numbness in the fingers and toes to unconsciousness; repeated exposure to moderate to high amounts may cause liver and kidney effects. Everybody is now talking about “water based” inks, as if that’s the answer to help reduce these emissions. So, let’s investigate these inks and see what “water based” means, and what the concerns may be. The two inks used most often in textile printing are water-based (used mostly for yardgoods) and plastisol inks (used for printing finished goods, such as T shirts, sweatshirts, tote bags). SOLVENT-BASED INKS: The solvent has two primary functions: 1) to carry the ink to the substrate, and 2) to evaporate quickly, leaving only the ink film on the substrate. While water is a solvent, the name solvent-based ink is used to describe a highly volatile solvent such as 2-butoxyethyl acetate, cyclohexanone and n-butyl acetate. Solvent based inks are considered the least environmentally friendly due to the highly volatile solvents given off during printing and drying. The petroleum-based binder used in many solvent-based inks could be replaced with renewable resources such as vegetable oil or soy. The downsides are that the inks dry very slowly are less durable, and still contain solvents emitting VOCs during printing. Therre are now inks on the market called Eco Solvent inks. To most people, “eco” means ecological, and to be fair these inks are not as nasty as full solvent inks. But these inks generally contain glycol esters or glycol ether esters – both derived from mineral oil – hardly a renewable resource or an ecologically sound process. Tony Martin, president of Lyson Inc. suggested we call these inks “mild” vs. the “aggressive” traditional solvent inks. Also since these inks are generally used to print onto PVC, the green claim sorta gets overlooked by the elephant in the substrate. WATER-BASED INKS: These use water as the main solvent. But that does not mean that water is the ONLY solvent used. It is significant to note that many water base inks contain “co-solvents” which may even be petroleum based solvents. 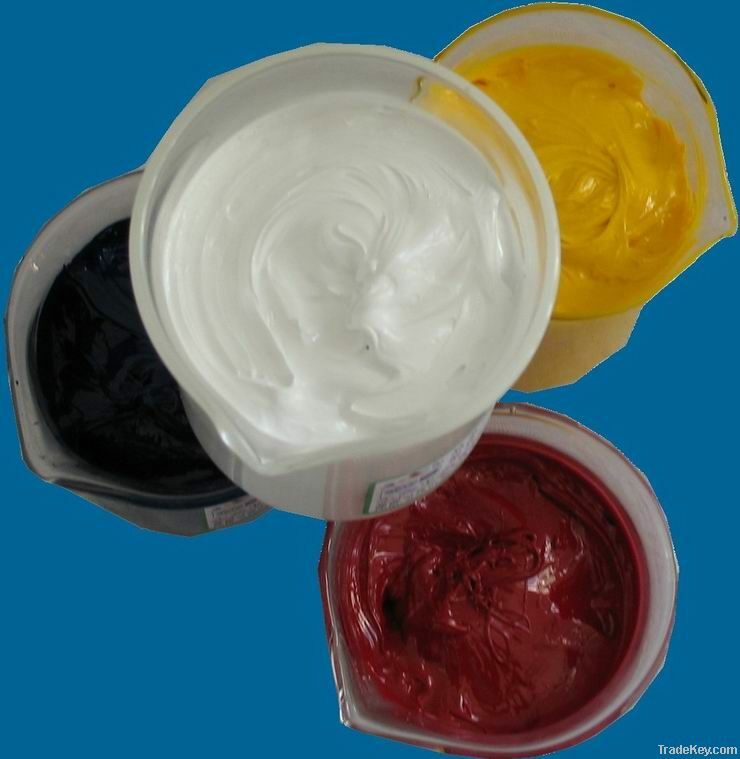 ( See Printing – Part 2 for components of typical water and solvent based inks.) The reason these co-solvents are used varies, but a main reason is to decrease the time and heat necessary to cure the ink on the fabric. There are two types of water-based inks: Traditional (air dry) ink and Discharge ink. Traditional air dry ink soaks into the cloth and binds with the fibers providing good colorfastness and wash ability. Discharge ink removes the original dye/color from the garment and replaces it with a color/pigment. Discharge inks are now available in formaldehyde free formulations, such as the Oasis Series by Wilflex, making them safer for the user and the environment. Water based inks are usually less expensive than solvent-based inks and are similar in quality, gloss, and adhesion. These inks are inexpensive and easy to manufacture. In fact, with some experience and the proper equipment, printers can even make them in small batches from basic natural components. They have a very limited shelf life and are difficult to re-use, so they generate more wasted ink than regular plastisols or more complex, manufactured water-based inks. While this type of water-based ink is considered a very green alternative, this extra waste is something to consider. An advantage often cited for water-based inks is that they do not require organic solvents when cleaning the presses. But there is a common misconception that because water can be used for cleaning screens, squeegees and tools, that the waste water can just be discharged into the sewer. However, the water-based ink is not just water. There are pigments, binders, thickeners, and sometimes, even co-solvents in the ink residue. Many printers believe that screen printing using water based inks is the cutting edge of textile printing. So why isn’t everybody using them? Water-based inks cure as water evaporates out of the ink so they have a longer – and more difficult – drying time than plastisol inks. This means that the water — along with whatever in the ink evaporates with the water — enters the environment. If using water-based ink, the facility must have the drying capacity to remove the water. The dryers used for water-based printing tend to be larger than those needed for plastisol. In plastisol printing, the ink film must only reach the cure temperature for a brief moment. With water-based ink, the temperature must be reached and then held until all of the solvent (water) is removed. There are water-based inks that will air dry but they are usually only acceptable for craft level printing as the room required for curing greatly reduces productivity. Finally, all water-based inks can start to dry out during use, so care must be taken to prevent the ink from drying on the screen. If water based ink is left in open mesh for even a short period of time, it can clog the mesh and ruin the screen. Practiced waterbased ink printers must always be conscious of how long a screen sits between prints to prevent the ink from “drying in”. While modern water-based inks are less prone to this phenomenon, it is still a concern. In addition, overall shelf life is limited. There have been major improvements in manufactured water-based inks in recent years. These newer inks have a number of performance advantages over the basic water-based inks discussed above and are as potentially eco-friendly and sustainable as any alternative. For example, they resist drying, and remain useable far longer than traditional water-based and discharge inks. They can be re-constituted with water — and additional binder, if needed — which can cut back on waste. Shelf life of these newer water-based inks is substantially longer as well because the manufacturers have developed technology to encapsulate the water in the ink in such a way that it does not readily evaporate until printed. Much like traditional plastisol, these water-based inks are sold ready to use as colors or underbases and have a thicker viscosity that yields greater opacity on finished prints. They can be reduced with water and other modifiers for a softer hand. PLASTISOL INKS: Plastisol inks, commonly used for textile printing and especially for t-shirts, are a PVC-based ink composed of a clear, thick plasticizer fluid and PVC resin. The full name for PVC is polyvinyl chloride. The PVC life cycle results in the release of toxic, chlorine-based chemicals which end up as by-products such as carcinogenic and highly toxic dioxin and PCB. The major health concern about plastisol inks is not that they are PVC-based but that they contain phthalates. Phthalates are added to PVC plastics to transform a hard plastic into a soft, rubbery plastic by allowing the long polyvinyl molecules to slide against each other instead of rigidly binding together. These phthalates used in plastisol ink to make the PVC flexible are also carcinogenic and much research has been done which substantiates the damage phthalates do to us, especially to fetuses and newborns. They are released into the environment during the printing and curing of the ink and they will continue to exhaust toxins when exposed to a radiant heat source, such as a dryer or even sunlight. Plastisol inks contains virually no solvents at all. Plastisol does not “dry”. In order for a compound to dry, there must be evaporation of some kind of solvent. These inks typically contain less than 1% VOC. Some water based plastisol inks can contain about 30% VOCs. Since plastisol has little or no solvent, it cannot dry. Plastisol is a thermoplastic ink – meaning it is necessary to heat the printed ink film to a temperature high enough to cause the molecules of PVC resin and plasticizer to cross-link (i.e., bond to the fabric) and solidify, or cure. Cross-linking agents must be used to effect the bonding, and formaldehyde is often a necessary component of these cross linkers. The temperature at which most plastisol for textile printing cures at is in the range of 300 °F to 330 °F. Because of this characteristic, plastisol can be left in screens for long periods of time without clogging the mesh, the lids can be left off of the ink containers (although keeping them covered is a good practice to keep lint and dirt out of the ink). And ink left at the end of the job can be returned to the container for reuse without any adverse affects. This last practice is a great benefit in reducing waste product. It is ready to use right out of the container more than 90% of the time. In most applications, it can be printed wet-on-wet, which allows for increased production speeds. It comes in formulations that can be printed on light and dark fabrics. Because both PVC and phthalates are chemicals of concern, many companies are offering phthalate free plastisol inks. These non-phthalate inks are not as easy to work with as standard plastisols, but it is possible to use them to accomplish most of the common printing techniques. In addition to non-phthalate plastisols, there are some new acrylic-based screen printing inks that are sometimes referred to as non-PVC and non-phthalate plastisols. Why? Well, an acrylic-type resin replaces the PVC resins used in regular plastisol. Also, the plasticizer in acrylic inks is normally non–phthalate, making these inks an even more eco-friendly alternative. With some experience, acrylic inks can be successfully made into high-density designs. The finished prints lack the soft finish of a standard high-density plastisol print, but this may be an acceptable compromise to some customers. Acrylic inks are usually a little more costly than standard plastisols and are substantially more expensive than standard water-based inks. The hazards of plastisol printing inks are not just to personal health but also to environmental health. Garments coated with plastisol inks do not decompose and they are difficult to recycle. The result is that you may soon grow tired of your Rolling Stones concert tee shirt and trash it, but it will live on in immortality in the local landfill. If clothing designed with PVC plastisol ink is incinerated, the trapped dioxins plus hydrochloric acid (a primary component of acid rain) are released into the atmosphere. New inks have also been developed for digital printing, such as latex, resin and UV curable inks. We’ll discuss them next week with digital printing. So you’d think that the major source of the emissions comes from using these inks – the printing process itself. You’d be wrong: the majority of emissions to the atmosphere from textile printing is from the drying process, which drives off volatile compounds. The largest VOC emission source is the drying and curing oven stack, which vents evaporated solvents to the atmosphere. Another source of fugitive VOC emissions comes from the “back grey” (fabric backing material that absorbs excess print paste), which is dried before being washed. In processes where the back grey is washed before drying, most of the fugitive VOC emissions from the back grey will be discharged into the waste water. In some roller printing processes, steam cans for drying printed fabric are enclosed, and drying process emissions are vented directly to the atmosphere. As of the publication date of the EPA Sector notebook on the Printing and Publishing Industry (1995), there was no add-on emission control technology for organic solvents used in the textile printing. Another environmental hazards in printing textiles comes in the screen and equipment cleaning steps – which use lots of water. When you finish a printing run, for example, there are still approximately 1.5 gallons of printing paste in the system, predominantly in the tubes that run between the paste reservoirs and the screens. This is simply rinsed out and flushed down the drain. If using plastisol inks, in order to emulsify the ink for easy removal from screens, squeegees, flood bars, spatulas, and work surfaces, it is necessary to use some type of solvent. Solvents used to clean printing equipment include toluene, xylene, methanol, and methyl ethyl ketone (MEK). In addition, blankets used to transfer the ink-filled image to sheets of paper are cleaned with washes that contain glycol ethers and 1,1,1-trichloroethane (TCA). The type of solvent used depends largely on the equipment to be cleaned. For example, a blanket wash must dissolve ink quickly and dry rapidly with minimal wiping. Conversely, a solvent that is intended to clean a chain of ink rollers must evaporate slowly, to insure that it does not flash off before it has worked its way through all the rollers. Water based inks contain co-solvents, additives, dyes and/or pigments, which make the water clean up full of possibly hazardous materials. All of these components must be washed thoroughly. Remove the paste: Any and all excess paste in the screen should be “carded off” for reused on another job. The screen must then be washed to remove any remaining paste because the paste will interfere with the process of removing the stencil. Screen cleaning solvents are a source of VOC emissions. Emulsion removal: The stencil or emulsion is removed by spraying the screen with a solution of water and emulsion remover chemicals which is comprised mainly of sodium metaperiodate, then rinsing the solution away with fresh water. Haze or ghost image removal: Finally, if any haze or “ghost image” remains, a haze remover must be applied. Some haze remover products are caustic and can damage or weaken the screen. Haze removers make screens brittle and tear easily, therefore only small amounts should be used. Ghost image is a shadow of the original image that remains on the screen caused by paste or stencil caught in the threads of the screen. The best way to reduce VOCs during screen reclamaition are related to technology and best practices, such as using high pressure wash systems and modifying how chemicals are applied to the screens. Leftover print pastes cannot be allowed to enter the wastewater treatment system. It must be disposed of as a solid waste. Sites where sludge piles are used can have environmental problems with ground and groundwater contamination. These sludge storage areas should be equipped with waterproof linings to prevent this from occurring. In fact, textile printing is becoming an important wastewater source as the water-based materials replace the organic solvents. The wastewaters originating from this operation are often strong and may contain toxics, although their volume is still quite low. The screen printing industry has been very proactive in the creation of products that can minimize the impact of these cleaning processes. Solvents are available that are “more” environmentally sensitive than the traditional petroleum based solventsCompanies are beginning to market biochemical cleaning solutions, inks and additives to replace current solvents or toxic chemicals– examples include the use of terpene d-limonene (derived from citrus fruit), coconut oil , soybeans, seaweed and fatty amides. (8) In addition, there are many types of filtration and cleaning systems available to capture inks and solvent residues to minimize the solids that are discharged into the sewer system. Maintain dryers – is it really worth saving money by buying that second hand dryer? A new one is 30% more efficient, twice the price but the energy savings will pay the difference in 9 months. An average printing line has a nominal power rating of 75 kW, most of which is required for the drying process. It is well known that the “finishing” of a fabric is where a great deal of the environmental impact occurs – it uses the most water, chemicals and energy. “Finishing” includes not only the application of treatments to make fabric perform in a certain way (i.e., to be free of something, such as static, wrinkles, or odor, or perhaps be waterproofed or flameproofed). It also includes the decoration of the fabric. This decoration can be simply dyeing the fabric a vibrant color. But glorious designs on fabrics have always been popular. 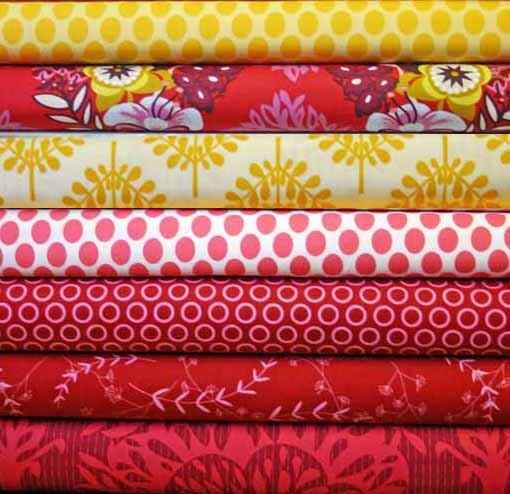 Applying colored patterns and designs to decorate a finished fabric is called ‘printing’ – and we sure do love them! Humans have been printing designs onto fabric for centuries. It has been found on cloth in Egyptian tombs dating to about 5000 B.C. and India exported block prints to the Mediterranean region in the 5th cent. B.C., demonstrating that the Indus Valley civilization knew well the art of dyeing and use of mordents 5,000 years ago. Printing on fabric is still very much in use today – we could even say it’s wildly popular – and there’s a lot of talk about the sort of printing inks and dyestuffs used to print fabrics. So I thought we’d take a look at textile printing and try to find out what the consequences of printing may be to us and the planet. Printing is one of the most complex of all textile operations, because of the number of variables and the need for a high degree of precision, particularly since there is no way to correct a bad print. So we’ll be looking at this topic over several weeks. Technically, printing on textile can be defined as the reproduction of a decoration by application of one tool loaded with coloring material on a textile support. 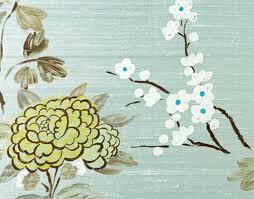 Early forms of textile printing are stencil work, highly developed by Japanese artists, and block printing. In the latter method a block of wood, copper, or other material bearing a design in intaglio (or relief) with the dye paste applied to the surface is pressed on the fabric and struck with a mallet. A separate block is used for each color, and pitch pins at the corners guide the placing of the blocks to assure accurate repeating of the pattern. Another style of fabric printing documented in Nuremberg, Germany, was the application of gold or silver dust on still wet fabric. This was an inexpensive way for lesser monasteries and churches to copy the expensive brocades from the Near and Far East, which arrived in Europe via the silk routes. These silk routes most often started in Italy, Venice in particular, and travelled over both land and sea. To economize further in the copying process, color was often filled in areas with a brush, reducing the number of blocks needed. Velvet effects were also added sometimes, this was accomplished by spreading powered wool on the gummed ink pattern. The document found in Nuremberg gave specific directions for duplicating the flowers and animals from the brocades. These procedures could only be used on tapestries, church vestments and table furnishings because the colors weren’t fast. Because they couldn’t be washed these ornate fabrics were not used for clothing. Preparation of the print paste. Fixation of the printed dye or pigment. We’ll begin with taking a look at step #2, printing the fabric: today, a decorative pattern or design is usually applied to constructed fabric by roller, flat screen, or rotary screen methods. Cylinder or roller printing was developed around 1785. In the roller printing process, print paste is applied to an engraved roller, and the fabric is guided between it and a central cylinder. The pressure of the roller and central cylinder forces the print paste into the fabric. Because of the high quality it can achieve, roller printing is the most appealing method for printing designer and fashion apparel fabrics. Screen printing is by far the most popular technology in use today. Screen printing consists of three elements: the screen which is the image carrier; the squeegee; and ink. The screen printing process uses a porous mesh stretched tightly over a frame made of wood or metal. Proper tension is essential for accurate color registration. The mesh is made of porous fabric or stainless steel. A stencil is produced on the screen either manually or photochemically. The stencil defines the image to be printed in other printing technologies this would be referred to as the image plate. In flat bed screen printing, this process is an automated version of the older hand operated silk screen printing. For each color in the print design, a separate screen must be constructed or engraved. If the design has four colors, then four separate screens must be engraved. The modern flat-bed screen-printing machine consists of an in-feed device, a glue trough, a rotating continuous flat rubber blanket, flat-bed print table harnesses to lift and lower the flat screens, and a double-blade squeegee trough. The in-feed device allows for precise straight feeding of the textile fabric onto the rubber blanket. As the cloth is fed to the machine, it is lightly glued to the blanket to prevent any shifting of fabric or distortion during the printing process. The blanket carries the fabric under the screens, which are in the raised position. Once under the screens, the fabric stops, the screens are lowered, and an automatic squeegee trough moves across each screen, pushing print paste through the design or open areas of the screens. Remember, there is one screen for each color in the pattern. The screens are raised, the blanket precisely moves the fabric to the next color, and the process is repeated. Once each color has been applied, the fabric is removed from the blanket and then processed through the required fixation process. The rubber blanket is continuously washed, dried, and rotated back to the fabric in-feed area. The flat-bed screen process is a semi-continuous, start-stop operation. 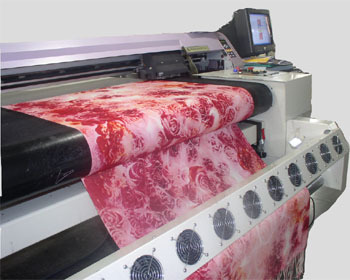 Flat screen machines are used today mostly in printing terry towels. Many factors such as composition, size and form, angle, pressure, and speed of the blade (squeegee) determine the quality of the impression made by the squeegee. At one time most blades were made from rubber which, however, is prone to wear and edge nicks and has a tendency to warp and distort. While blades continue to be made from rubbers such as neoprene, most are now made from polyurethane which can produce as many as 25,000 impressions without significant degradation of the image. From a productivity standpoint, the process is slow with production speeds in the range of 15-25 yards per minute. Additionally, the method has obvious design limits. The design repeat size is limited to the width and length dimensions of the flat screen. Also, no continuous patterns such as linear stripes are possible with this method. However, this method offers a number of advantages. Very wide machines can be constructed to accommodate fabrics such as sheets, blankets, bedspreads, carpets, or upholstery. Also, this technique allows for multiple passes or strokes of the squeegee so that large amounts of print paste can be applied to penetrate pile fabrics such as blankets or towels. Currently, approximately 15-18% of printed fabric production worldwide is done on flat-bed screen machines. Rotary screen printing is so named because it uses a cylindrical screen that rotates in a fixed position rather than a flat screen that is raised and lowered over the same print location. Rotary presses place the squeegee within the screen. These machines are designed for roll-to-roll printing on fabric ranging from narrow to wide-format textiles. In rotary printing, the fabric travels at a consistent speed between the screen and a steel or rubber impression roller immediately below the screen. (The impression roller serves the same function as the press bed on a flatbed press.) As the fabric passes through the rotary unit, the screen spins at a rate that identically matches the speed of substrate movement. The squeegee on a rotary press is in a fixed position with its edge making contact with the inside surface of the screen precisely at the point where the screen, substrate, and impression roller come together . Ink is automatically fed into the center of the screen and collects in a wedge-shaped “well” formed by the leading side of the squeegee and the screen’s interior surface. The motion of the screen causes this bead of ink to roll, which forces ink into stencil openings, essentially flooding the screen without requiring a floodbar. The squeegee then shears the ink as the stencil and substrate come into contact, allowing the ink to transfer cleanly to the material. By converting the screen-printing process from semi-continuous to continuous, higher production speeds are obtained than in flat bed printing. Typical speeds are from 50-120 yards per minute for rotary screen printing depending upon design complexity and fabric construction. Rotary screen machines are more compact than flat screen machines for the same number of colors in the pattern. Therefore, they use less plant floor space. Also with rotary screens, the size of the design repeat is dependent upon the circumference of the screens. This was initially seen as a disadvantage, because the first rotary screens were small in diameter. However, with today’s equipment, screens are available in a range of sizes and are no longer considered design limited. Today’s rotary screen machines are highly productive, allow for the quick changeover of patterns, have few design limitations, and can be used for both continuous and discontinuous patterns. Estimates indicate that this technique controls approximately 65% of the printed fabric market worldwide. The principle disadvantage of rotary screen printing is the high fixed cost of the equipment. The machines are generally not profitable for short yardages of widely varying patterns, because of the clean-up and machine down time when changing patterns. Flat screen printing is much more suitable for high pile fabrics, because only one squeegee pass is available with rotary screen. However, rotary machines are used for carpet and other types of pile fabrics. Most knit fabric is printed by the rotary screen method, because it does not stress (pull or stretch) the fabric during the process.